We hear it all the time “We want to buy jewelry for my girlfriend, Fiance or wife but we don’t know what to get.” Most of the time when our customers come into our ID Jewelry showroom on 15 West 47th Street in New York they have already visited other jewelers in the area and are more confused than when they started their search. She said “I do” Here is a review by one of our amazing customers, Sean Greene: “EVERYBODY HAS A GUY….when it comes to shopping for Jewelry. I decided to find my own……. 4 Years ago I had begun my search for a pair of diamond stud earrings as a birthday gift for my then girlfriend. I started my search by roaming the diamond district in Manhattan with little education on what to look for. As I entered storefront after storefront I started to feel overwhelmed and not sure who I could trust and couldn’t determine if I was getting the right deal. I decided to refer to the good old “interweb” for some guidance while also checking the credibility of a few diamond district jewelers based on feedback left by us consumers. That’s when I came across ID jewelry…… The volume of positive feedback that was left for the team at ID jewelry was impressive. I decided I had to check them out for myself. Yekutiel made me feel comfortable and didn’t apply any pressure. Most importantly I received an education on what to look for when purchasing diamonds. After some time, I found a beautiful pair of diamond stud earrings that were within my budget. 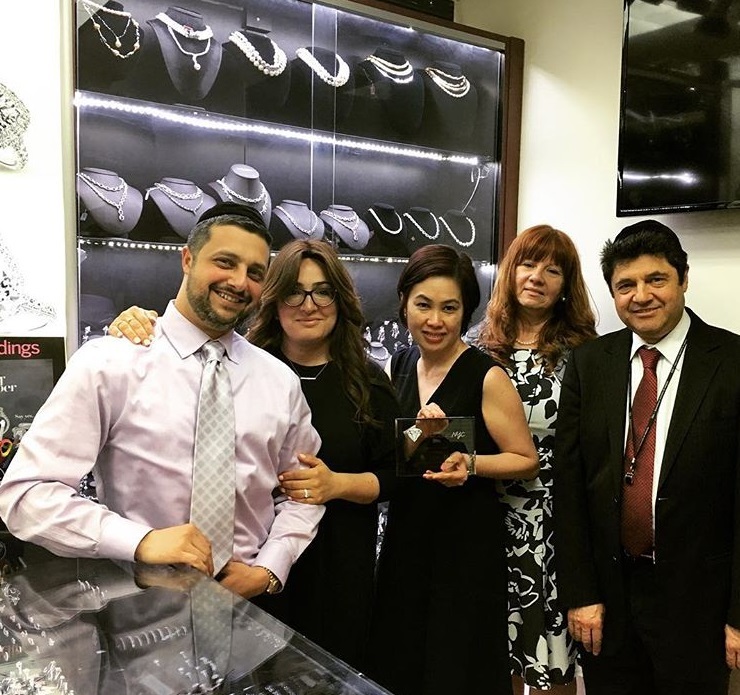 Little did I know that this would be the beginning to a long business relationship with Yekutiel.… A few years had passed and I realized the time had come to begin my search for an engagement ring. To prevent a long story from getting even longer ….. I eventually returned to ID jewelry to search for the perfect diamond. I experienced the same level of professionalism and patience I had received years earlier. Yekutiel again took the time to further educate me and showed me multiple diamonds that exceeded my expectations all while maintaining my budget. The service and value is unmatched. Whether you are in the market for something as simple as diamond stud earrings or that life-changing diamond engagement ring, I recommend you skip the hassle by going elsewhere and go see MY GUY, Yekutiel!” Another Happy Moment This is just one of the hundreds of amazing reviews by our customers. You will see here at ID Jewelry we take that family business dynamic and include all of our customers into our family, The ID Jewelry Family. We pride ourselves on taking our time and explaining every last detail to our customers and answer every question; no question is a bad question. Purchasing jewelry is a big investment and our goal is for you to leave our showroom comfortable and confident that you are making the right decision. We would rather see you get a better quality piece of jewelry that is under budget that you will love than trying to get you to spend more when we know the quality might not be as good. Yekitel and Happy Customers The last few months we have been featured in some amazing publications like Gotham Magazine, Fashion Week Daily, and The Luxury Lifestyle Magazine. We feel very honored that we are able to get our story out to the world. Please check out the links to the articles above to read all about our ID Jewelry Family. When we receive amazing press like this it really means the world to us. Back in 1986 Israel Davidov started ID Jewelry with just some pearls and marcasite pieces. And today ID Jewelry has become accredited with some of the highest accolades bestowed upon a jewelry manufacturer. Israel and his son Yekitel have been pouring their hearts into helping and providing everybody that comes in contact with ID Jewelry with A+ service and beautiful jewelry. All smiles at ID Jewelry In the early years of ID Jewelry, there was no such thing as E-commerce or online shopping. So when shopping online started to become “a thing” we adapted and starting putting our amazing catalog of jewelry online for the world to see. These days you can visit our beautiful website at https://idjewelry.com or come into our New York City showroom. We are also on eBay and Amazon come check us out. We have a lot of customers who see a beautiful piece of jewelry on our website and want more information on it. So what we do is send you beautiful pictures or videos of the product and either answer any questions you have by email or phone. We have customers that ask questions for over a month and want to see multiple items. Like I said earlier no question is a bad question we are here to welcome you into the ID Jewelry Family. Welcome to our family.